I see a flock of pigeons flying over my house every morning and every morning I am thankful that they continue on their way. I am not sure why they fly over every day but as long as they keep going that is fine by me. I live in the suburbs so it is not as likely for me to have a pigeon problem but you never know. 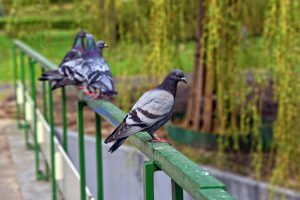 In fact there are many people out there (both residential and businesses) within the city as well as in the suburbs that have a pigeon problem. I have discovered 6 effective ways to get rid of pigeons. But first let’s figure out why there is a problem in the first place. 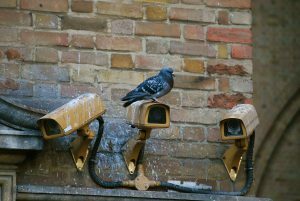 Pigeons like to roost on the rooftops of taller buildings, on gutters, on open wide ledges, railings, on bridges, and over passes. They are also a problem at airports. 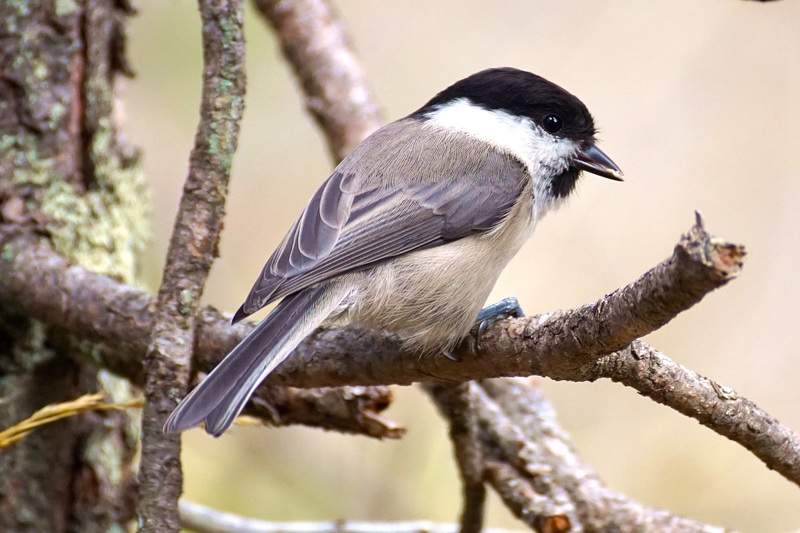 They like to nest on pretty much all of the above including the eves of roofs, openings in buildings, vents, under air conditioners, and on those ornate roofs where they can build their nest in between the grooves. And….pigeons have three broods per year. That means they multiply! Pigeons hang out in groups and will eat grass seed, plants, berries, grain, dog and cat food, bread crumbs, popcorn, french fries, peanuts, and many other types of food that humans may hand out to them. Pigeons are actually very clean birds standing alone but the problem is they tend to gather in large numbers. This can present a problem because all of those birds make plenty of droppings (i.e. guano or bird excrement). Did you know that a flock of one hundred pigeons can produce 4800 pounds of guano per year. Now that is disgusting and a very good reason to want to get rid of them. In addition to guano their feathers and nests carry harmful materials that if ingested could cause histoplasmosis. Histoplasmosis is caused by inhaling fungal spores which are found in soil and in the droppings of pigeons, bats, as well as other birds. Sure, if you practice good hygiene, the chances of getting it are pretty slim. But what about your kiddos? You don’t want them playing around pigeon poop do you? Pigeon droppings contain uric acid which is highly corrosive causing damage to your home. 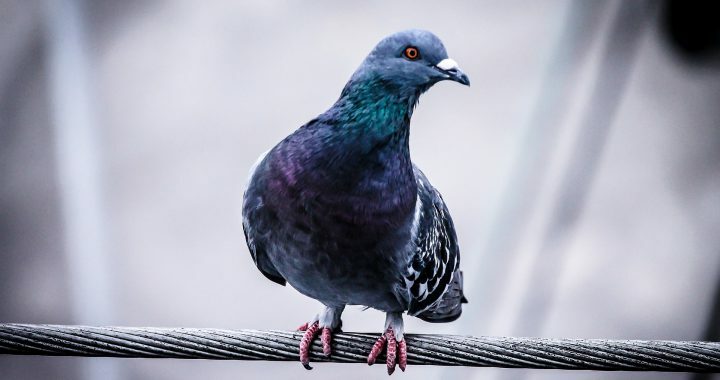 Roosting pigeon flocks can block your gutters and drains with their droppings and they can also cause damage to your air conditioner unit. I did some research and discovered six effective ways that people have had success with getting rid of these unwelcome birds. There are actually a lot more ways to try to get rid of pigeons (some people have tried them without success). I will also mention those in case you want to try for yourself. So keep reading…..
#1 Bird-X Stainless Steel Bird Spikes – These spikes are supposed to effectively repel pigeons, sparrows, starlings, crows, blackbirds, grackles, and swallows to name a few. You can apply them on rooftops, windowsills, signs, playgrounds, ledges, beams, gates, fences, barns, and more. You simply use a bird spike adhesive, nails, screws, or ties applies on straight, curved, or uneven surfaces. This set includes 10 linear feet of stainless steel spikes that measure 4.5” deep (for 5” effective depth coverage), sent as 10 one-foot linear segments. Directions are included. There is a ten year warranty on this. Added Note: The pros definitely outweigh the cons on this product. It may be worth a try. #2 APlus+ Ultrasonic Pest Repellent with Motion Sensor and Flashing Lights – this device works well for not only birds, but cats, dogs, raccoons, and skunks. It emits a mixture of ultrasonic, sonic and powerful flashing LED strobe lights, with a strong flashing LED to scare animals. There have been great reviews on this product. Some people actually use this with the bird spikes. #3 Bird-X Bird Proof Gel Bird Repellent – The product is a very thick, sticky, clear fluid. It comes in the same containers as caulking products. It applies easily if you heat the containers in hot water for a couple of minutes. Simply apply around perching areas. It is long-lasting, non-toxic and will not harm animals or buildings, easy to apply and maintain. This product seems to be effective, even waterproof, but a fair warning to you that it tends to be a little messy. However, it could be worth it! #4 Bird Netting – Bird netting is used to block pigeons and other birds from your garden, rafters, eaves, roofs, and the like. Reviews are more pro than con with a few claiming that this method works great along with the bird spikes. 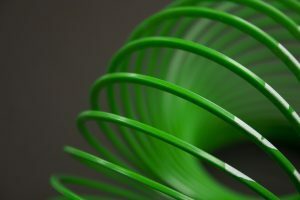 #5 A Slinky – You know the fun slinky that kids play with and maybe adults too. This works great on smaller areas. You attach a slinky to your balcony edge or railing extending one inch apart. Secure it with tape every six to eight inches. Pest control companies claim that this is very effective method. #6 Professional Service – this is going to be your most expensive way but if you have a serious problem and have had no luck with anything else then this might be your best option. The cost can be anywhere from three hundred dollars (small job) up to Two thousand plus dollars (big job). It all depends on what you need of course. Here’s the thing and you may not really care…but if you do this and get rid of them they will move on to the next house close by (your neighbor’s). Of course this could be with any of the other methods too for that matter. There are other options that you could try but from my research from other people’s experiences as well as my own with other pesky birds, I do not feel that they are worth the effort. Some have tried honey putting it on the area where pigeons roost. Apparently, pigeons do not like the sticky substance and will not want to stay. However, this is messy and will not last long if it rains. Some people have tried sprinkling strong spices such as chili powder, cayenne pepper, black pepper, and cinnamon, around their windowsill or wherever pigeons are gathered. They wrap them in cheesecloth too. After a good rain you have to reapply. As far as I’m concerned that can be pretty expensive and a waste of time and energy. There are also mirror reflectors and reflective tape that you can use. My husband and I tried the reflective tape method for a certain pesty woodpecker making holes in our previous house. All the woodpecker did was move over a few inches and start another hole. So I can’t imagine a pigeon being scared off by this either. Fake owls are another option. These plastic figures work well at first but pigeons are not stupid birds. They will learn that it does not do anything and will figure on staying. 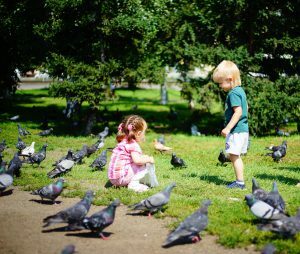 Pigeons can become a problem if you live in the city where they can be very abundant, but they can also be pests outside of the city too. There are a few things that I have found to be the best methods to get rid of them. This was all done by researching the reviews by other people who have found success using them. Try them for yourself if you have pigeons around and want them gone. You may be happy you did! Have you ever had a problem with pigeons? Let me know what you did to get rid of them. I would love to hear from you. Please make your comments below. Posted in Backyard Birds, Landscaping For Birds and tagged pigeons, rock pigeons.